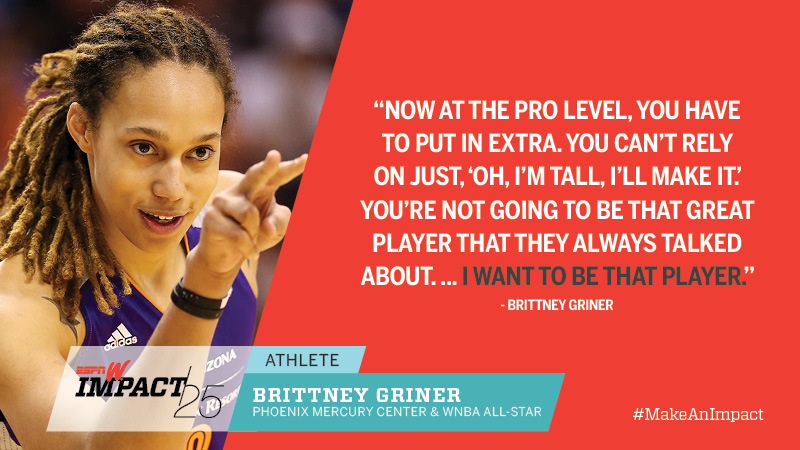 The second-year star has become a dominant post player, and became a WNBA champion when her Mercury won the title in a three-game sweep. 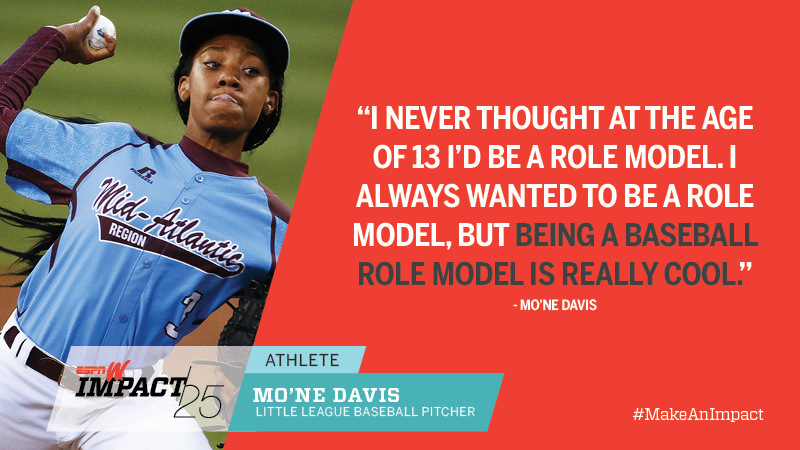 A passionate spokesperson in the LGBT community, she has also grown her game while playing in China. She had two more impressive wins in 2014 to boost her career record to 10-0, each successive victory paving the way for women fighters to get more exposure, pay and respect. She also increased her exposure as an actress in "The Expendables 3" and inked a deal for a memoir to be released in 2015. She followed up her 2013 Finals MVP with the 2014 regular-season MVP. 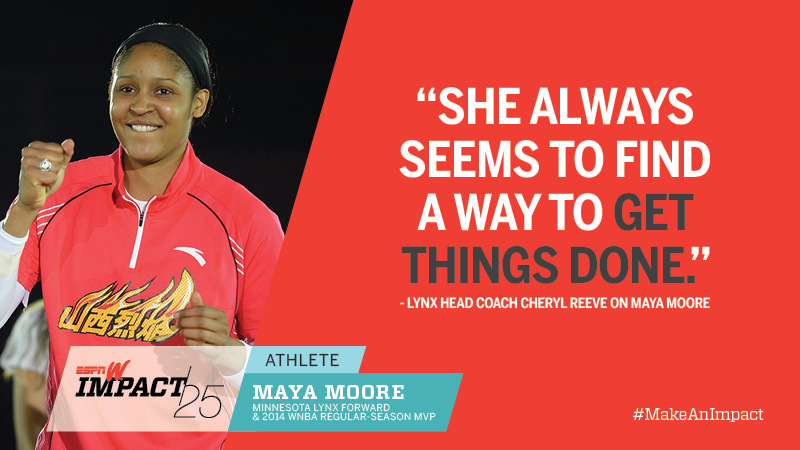 Moore was the WNBA's leading scorer with 23.9 points per game. 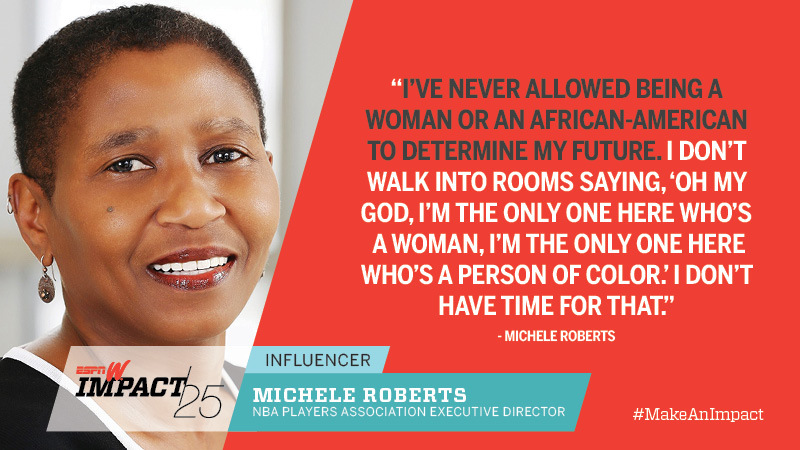 She had 12 games scoring 30 or more points, including a career-high 48 on July 22 against Atlanta, making a compelling case that she's the best women's player on Earth. At 24, Wie finally broke through for her first major victory, followed by a run at another victory the next weekend. 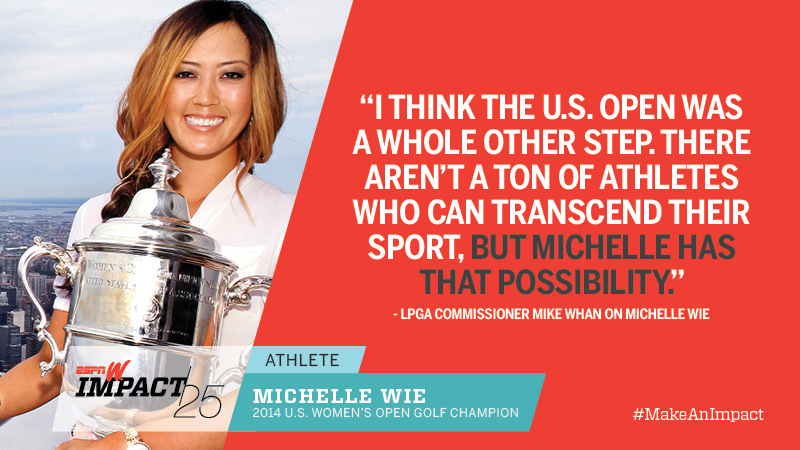 Her rise during the first part of the year ignited interest in the LPGA Tour. 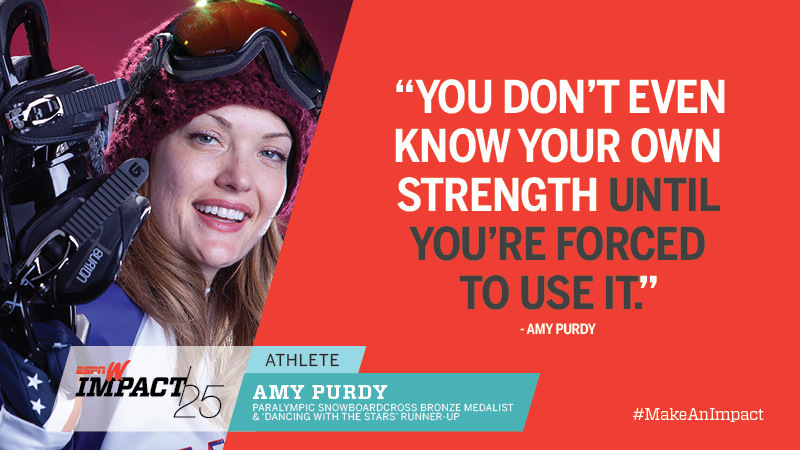 The reigning Olympic and world champion in slalom captivated the nation as one of the biggest American breakout stars from Sochi -- and she's still only 19! Ko earned a $1 million bonus in the Race for the CME Globe and won the season-ending Tour Championship for $500,000, making it the richest payday in women's golf. She ended the season with three victories and 15 other top 10 finishes, and has not missed a cut in 42 LPGA starts. After a two-year lull, Li came back in 2013-14 with three big wins; she also used her successful campaign to garner the needed support that would allow Chinese athletes to keep their athletic earnings. When Li retired in September with chronic knee injuries, she received messages of love and support from players and fans alike. 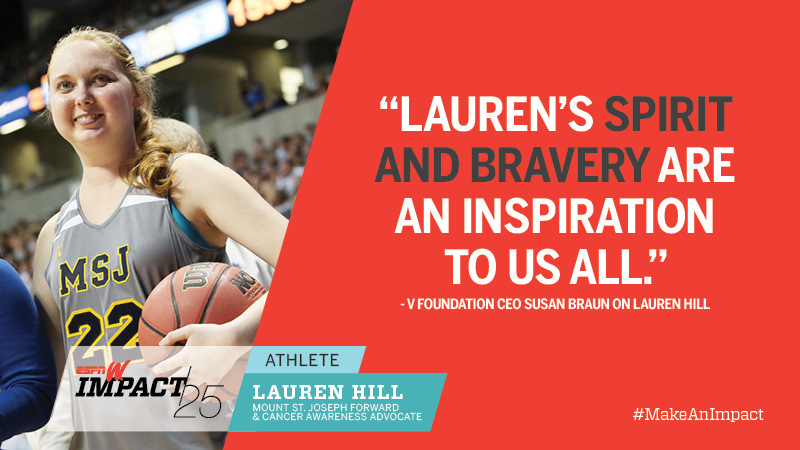 After battling a rare blood and bone marrow disease, she won the Arthur Ashe Courage Award at the ESPYs in 2013, then came out publically in a year-end Facebook post thanking her longtime girlfriend for her support. 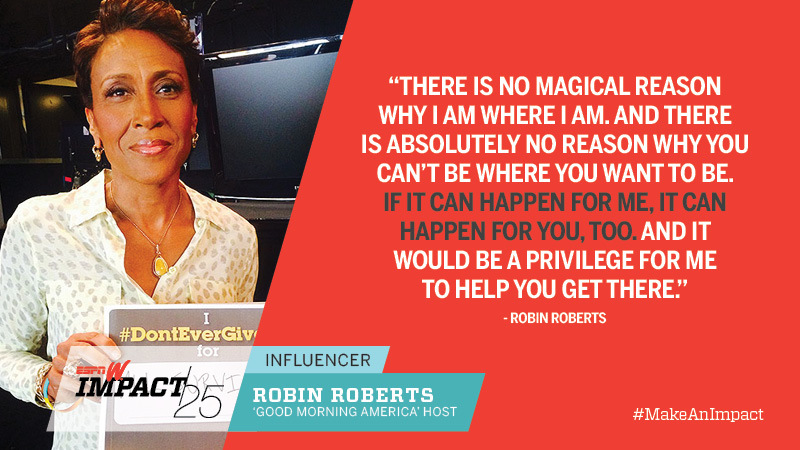 Roberts continued to serve as a role model and inspiration in 2014 through her storytelling and support for others, including ESPN colleague Shelley Smith, who announced her own breast cancer fight. 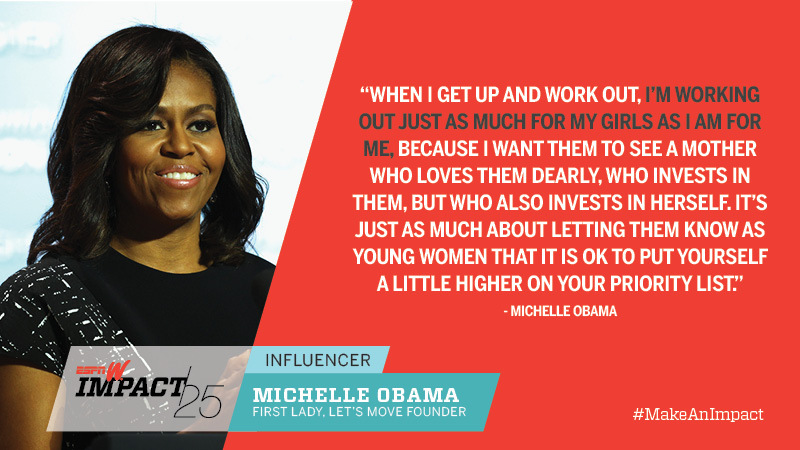 The active First Lady continues her campaign for healthier kids. She vowed this summer to fight "to the bitter end" to keep higher nutrition standards for school lunches, a hot topic of debate as Congress works to pass a year-end spending bill. 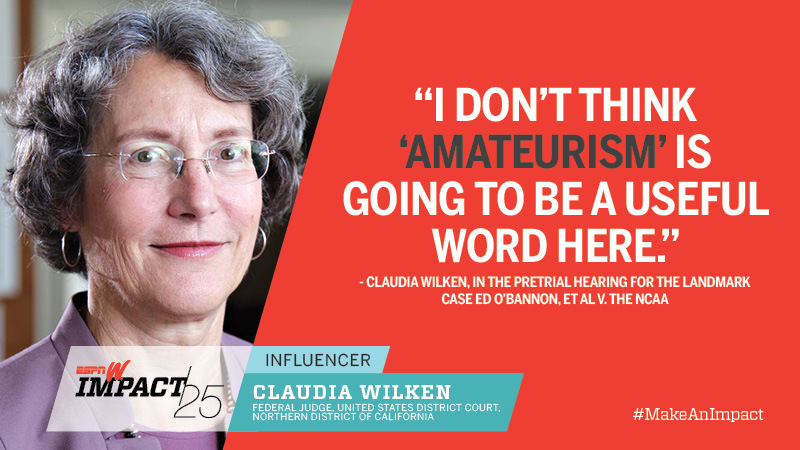 Her groundbreaking decision in the Ed O'Bannon case ruled the NCAA violated antitrust laws by restricting schools from providing money beyond scholarship limits to athletes. 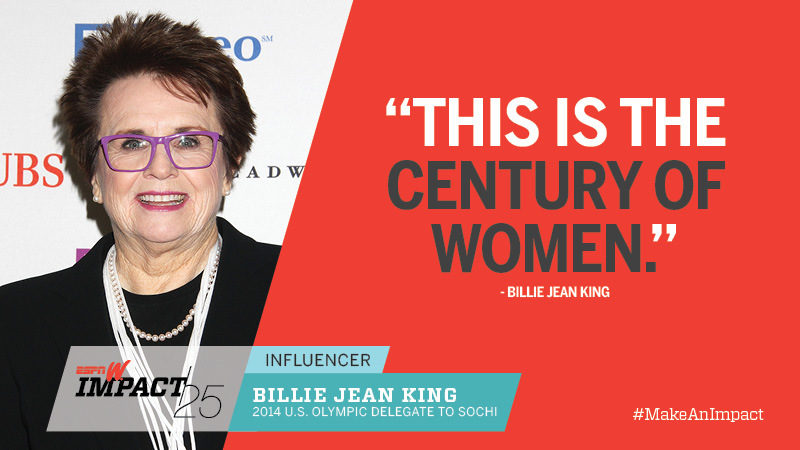 This pioneer was part of the presidential delegation at Sochi's closing ceremony, sparking further conversation around treatment of LGBT community members in Russia. 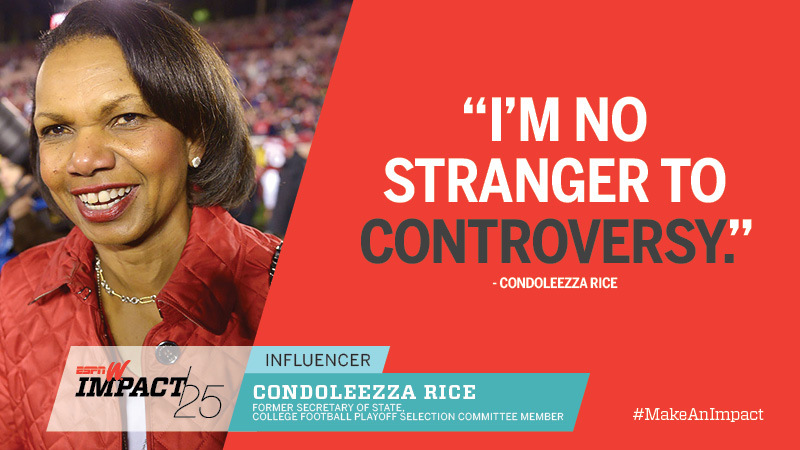 Rice became the only female member of the inaugural College Football Playoff committee, sparking an important conversation around the tired notion of, "She can't vote, she never played football." After record-breaking ratings and attendance, the league inched toward break-even status for the first time. 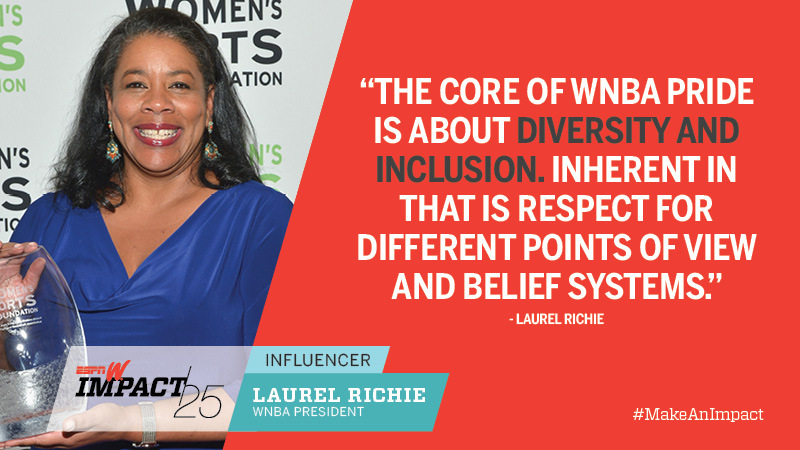 Richie also oversaw the WNBA's decision to formally embrace the LGBT community and ushered in stabilizing new ownership for one of its marquee franchises, the Los Angeles Sparks. 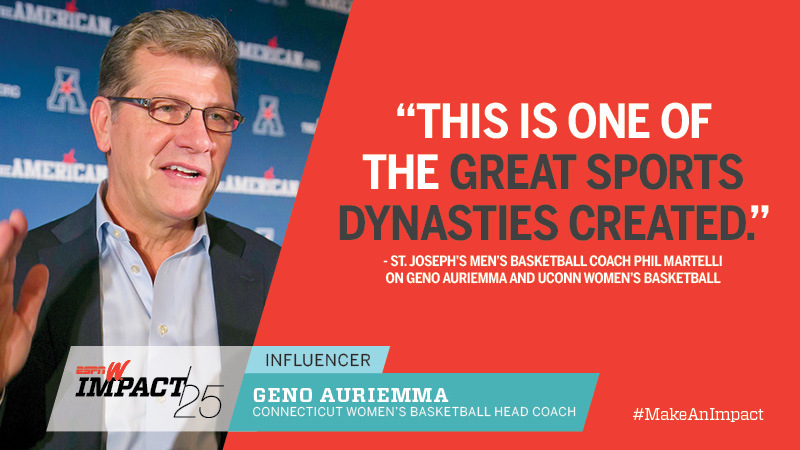 Another NCAA title, another unbeaten season for UConn's legendary leader. His team's success was pivotal in the 2013-14 season in the first year of the American Athletic Conference, and the Huskies don't show signs of slowing down as they aim to defend their title in 2015. 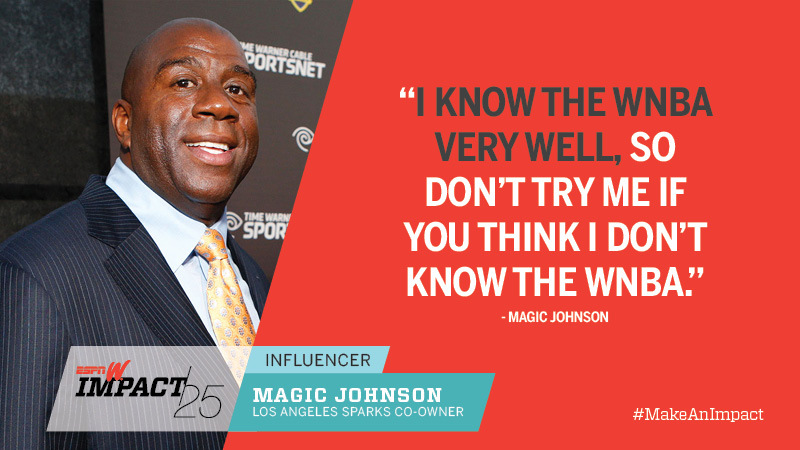 The NBA Hall of Famer played a critical role in an investment group that bought the Sparks. He's made his presence felt, encouraging a coaching change for the struggling team and working to bring stability to the franchise. 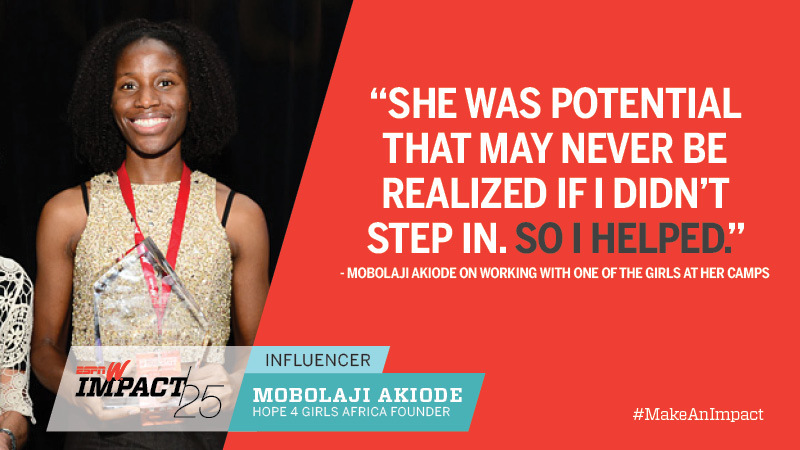 The former Fordham basketball player, who has helped African girls find success on the court through the nonprofit she founded, took a leading role after news broke that 300 Nigerian school girls had been kidnapped by a terrorist organization. The former U.S. national team star had a big year in the boardroom, becoming part of an ownership group for a to-be-named MLS team in Southern California. She was also named to Italian club AS Roma's board of directors. 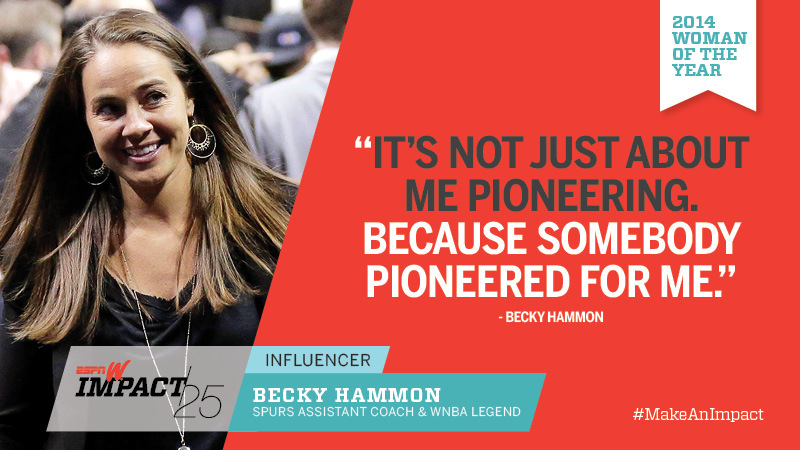 One of the few female chief executives or presidents in major U.S. pro sports, Zucker impressed the new owner of the talented franchise with the acumen she sharpened as the president of the West Coast's largest race track.